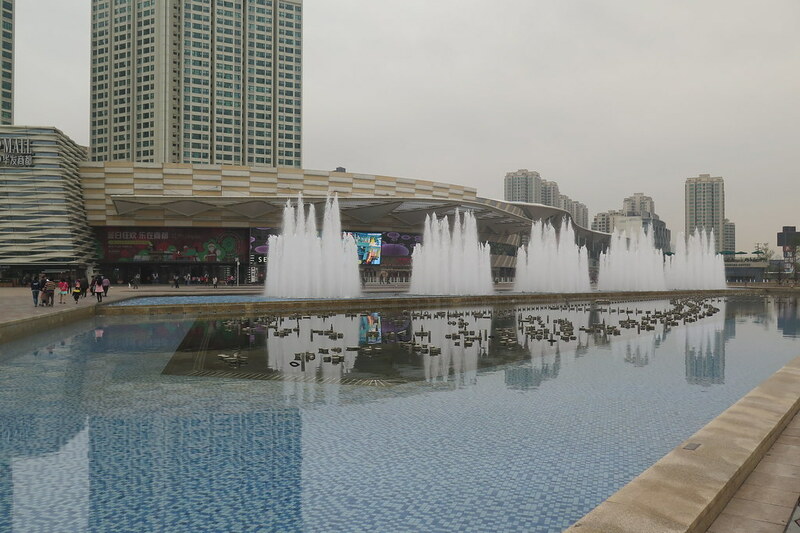 Leaving Zhuhai, we didn’t really have much of a plan. 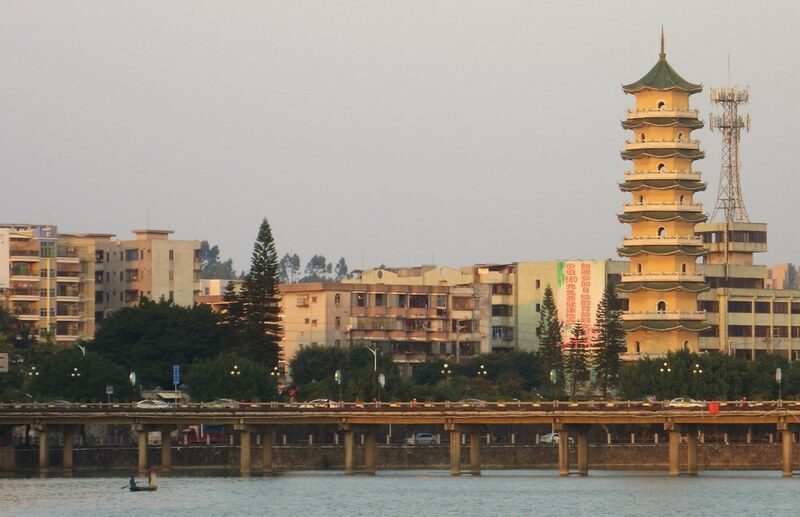 Obviously, we’d be heading west, but the only real deadline was that we hoped to reach the Vietnam border by the 29th or 30th which gave us quite a leisurely schedule. 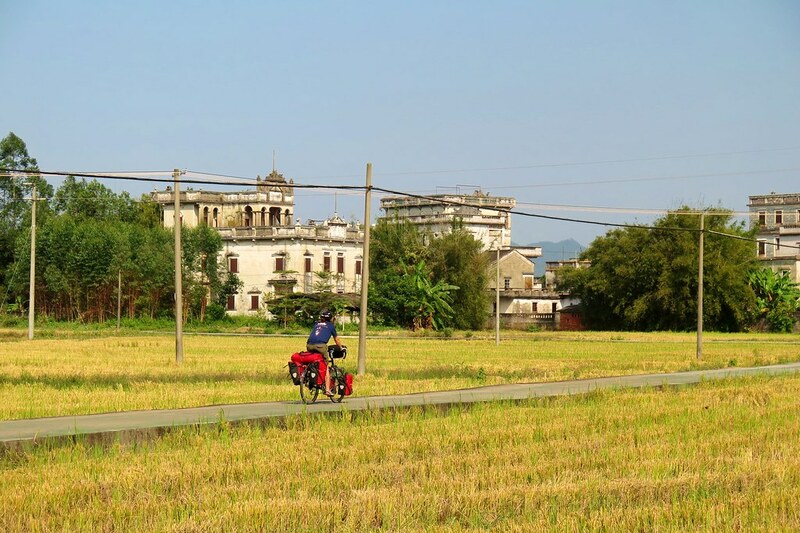 The first job was to get ourselves out of the very industrial Pearl River Delta area in Southern Guangdong and back into the countryside. The first couple of days cycling weren’t particularly interesting. 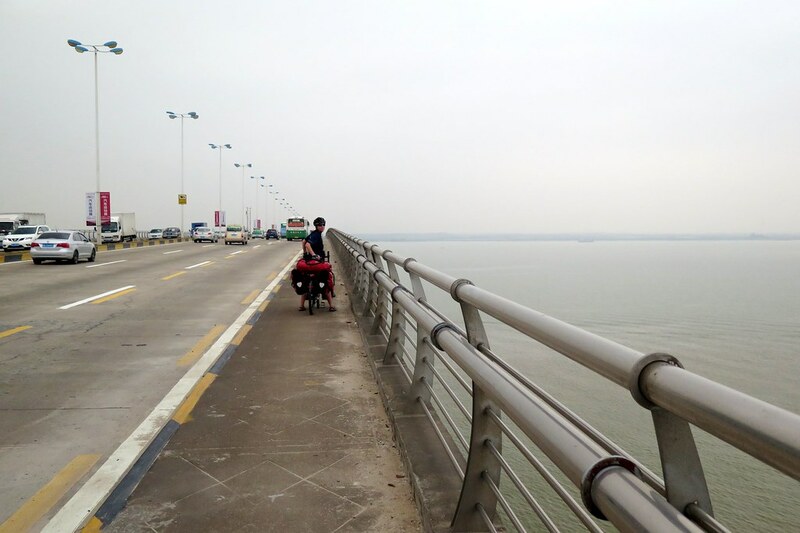 Immediately west from Zhuhai are a number of wide rivers, some of which we could cross on bridges, but others we had to ride upstream for hours to get across. Looking on the map, we didn’t move very far to the left in two days riding despite covering over 150km. The roads were quite busy with a lot of trucks, meaning we spent a lot of time riding through the debris at the edge of the road. 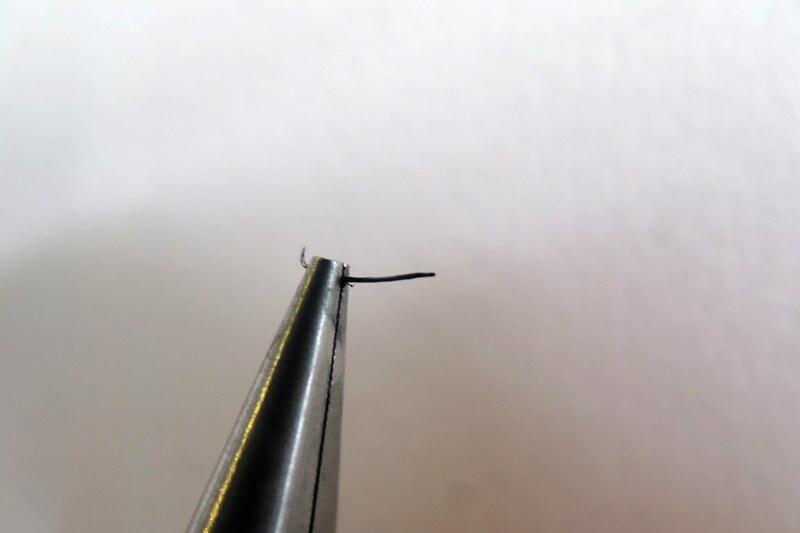 I picked up a puncture from a metal shard as a result. We were back into a full-on China smog cloud too, so the weather was quite warm and muggy, but we really didn’t see anything but grey murky skies. Luckily it was only a couple of days before we were back into less built up areas and the weather started to clear. 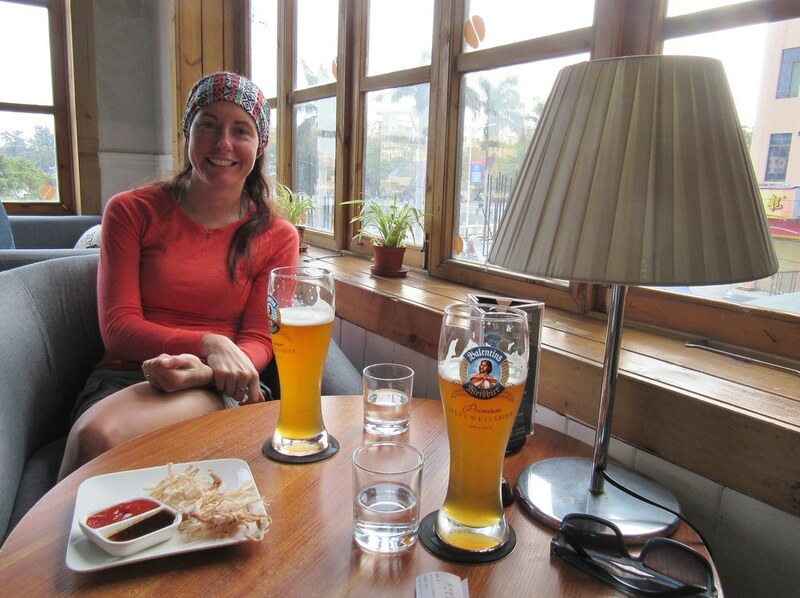 We also met a couple of other touring cyclists over those first two days. We were having lunch in a roadside restaurant and I spotted a bike with panniers disappearing up the road in our direction. He was on a road bike with only a light load, so I imagined he’d be moving quickly and we wouldn’t catch him. But later that day we came up behind him and another cyclist having a break at the side of the road. 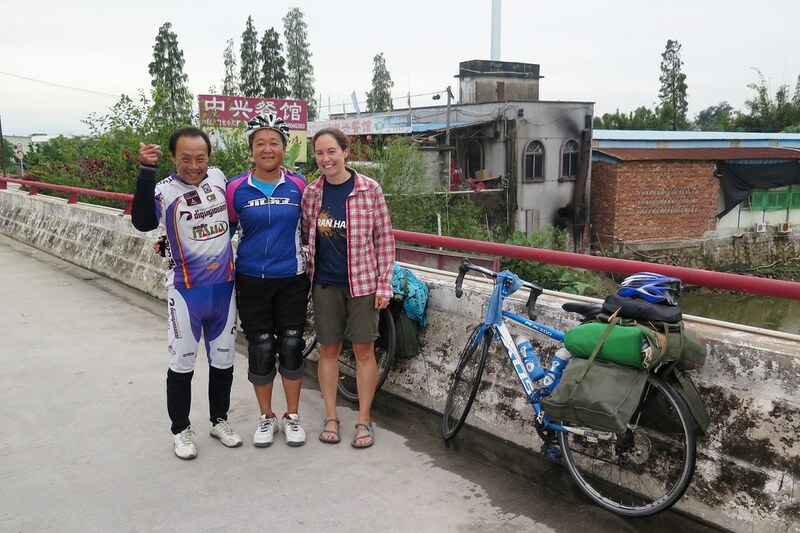 They were a husband and wife from Hainan Island, cycling together through Guangdong. They both had road bikes with canvas bags loosely strapped to a rear rack which slid and flapped around as they cycled. They couldn’t speak English, but we spoke, gestured and smiled with them and rode together for a few hours. 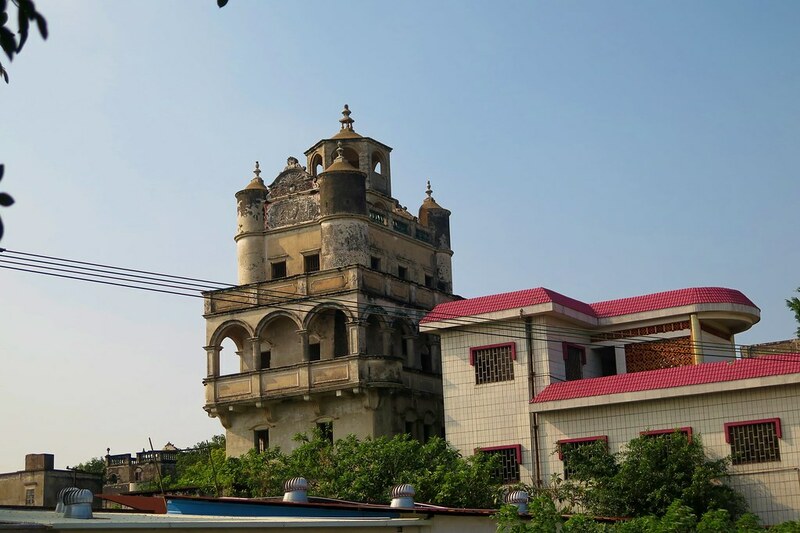 On the third day after leaving Zhuhai we reached the town of Kaiping. 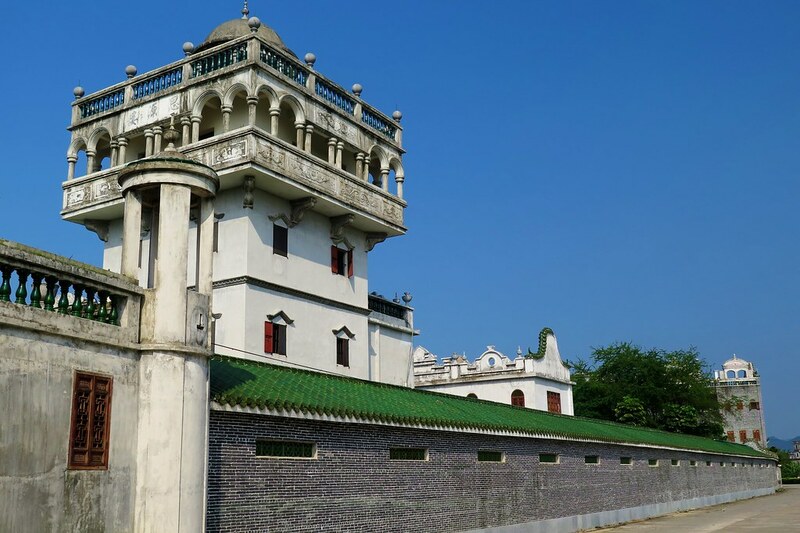 The surrounding area is famous for its many Diaolou towers, built by returning Chinese emigrants during the Qing Dynasty. The prospect of something interesting to look at and some sunny weather in the forecast lifted our spirits as we set off for a day of touring round the local traditional villages. We broke off from the main road to head towards Zilli village which has some of the best preserved towers. It was surprising quite how many of the strange, almost Middle Eastern looking structures were dotted around the rice fields. We spent a couple of hours riding around the tiny quiet roads taking pictures, making the most of having blue skies above us and some good scenery around. As we rode into Zilli itself, we were yelled at by a security guard and told to go over to the ticket office and pay 80 yuan each to go into the village. Standard Chinese tourist attraction. We didn’t pay, but just continued towards some of the other clusters of towers a little further away. Our route took us along a really quiet riverside road into another small village. We heard a guy shouting from behind us , but didn’t really think anything of it (you hear a lot of raised voices in China!). 20 minutes later we had parked up our bikes and were wandering around one of the towers when a policeman on a motorbike rocked up and started asking for our tickets. Yet another ridiculous admission fee. We played dumb and gestured that we were just riding our bikes around. I don’t think he could be bothered to pursue the issue and we weren’t going to pay, so we just got on our bikes and continued riding slowly back down the road that eventually took us out of the village and back to the main road. The good weather continued for us, with temperatures up in the 20s, which gave us really pleasant conditions for cycling. We also had a solid tail wind for a couple of days so we made quick progress. We worked our way west along the G325 which follows the coastline, giving us occasional views of the sea to our left and mountains on our right. 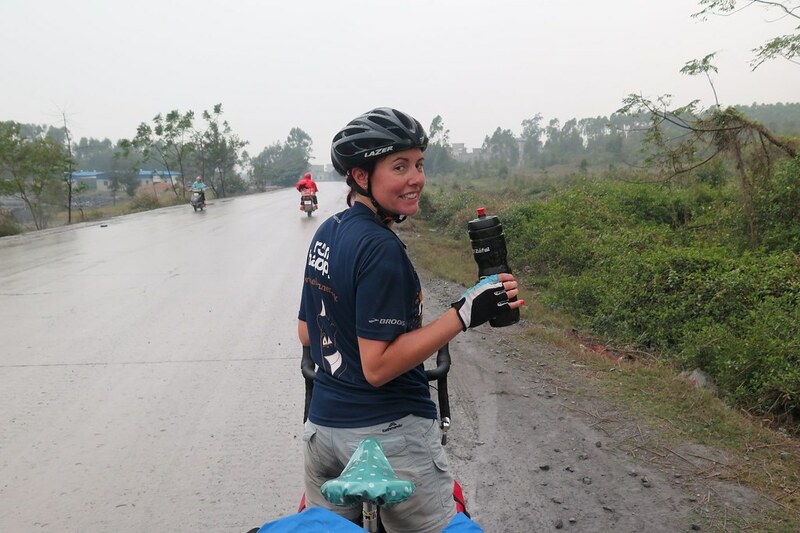 We passed through Yangjiang, then Yanxi, covering between 80 and 100 kilometers each day. We definitely got our mojo back and settled into our regime of mid morning tea stops and roadside lunches chosen by pointing at ingredients in a fridge. 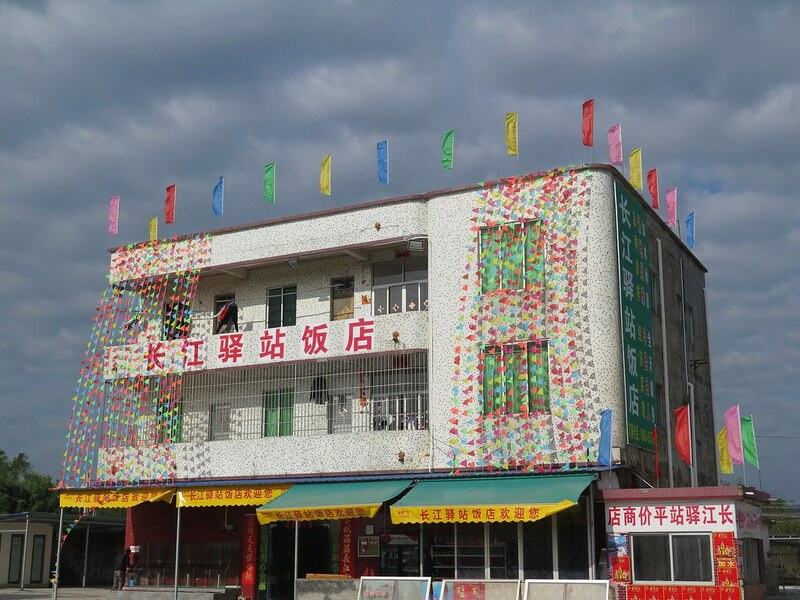 We reached Dianbai, a nice seaside town, by December 18th. This is the date that Clare and I met 12 years ago, and we usually do something each year to celebrate the date. This year we took a day off the bikes and stayed in a slightly nicer than usual hotel for a couple of nights. Amazingly for mid December, and for China, we spent the day on the beach! We saw signs around the town pointing towards ‘China’s number 1 beach’ so we thought it’d probably be worth checking out, but didn’t have high hopes. 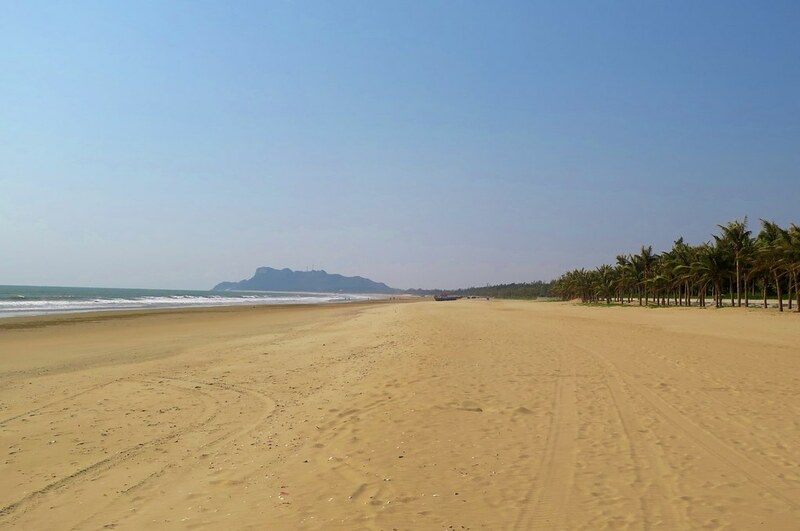 When we arrived, we found a beautiful stretch of clean sand, lined with palm trees. The sea seemed fairly clean and was even warm enough for a swim. 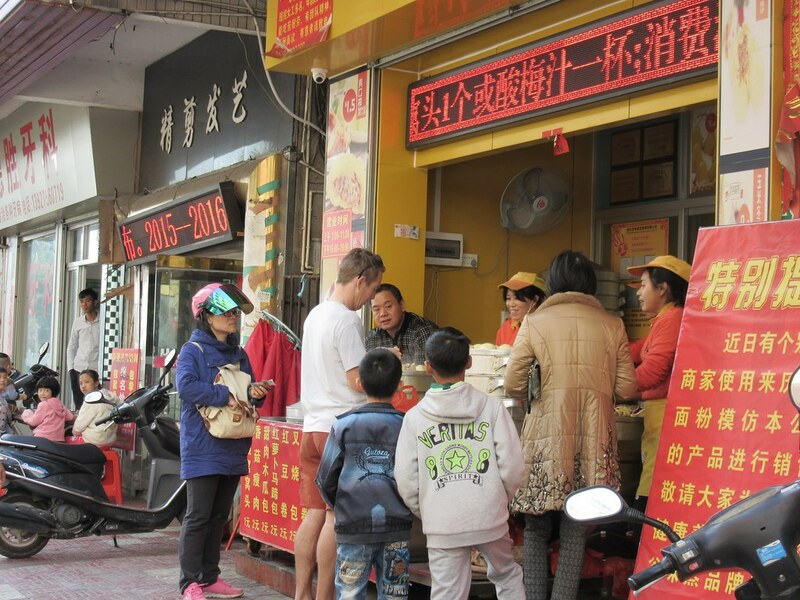 We no doubt raised a few eyebrows with the people walking next to the beach in their puffy jackets and winter clothes when they saw us swimming and sunbathing, but we’re used to getting stared at in China. Looking ahead and thinking of Christmas coming up, we were looking for a good place to have another few days off to relax and enjoy the festive period. We spotted a small island off the coast to the west of Hainan, Weizhou, and thought about heading over there by ferry, but the weather forecast wasn’t looking like the warm weather was going to continue. 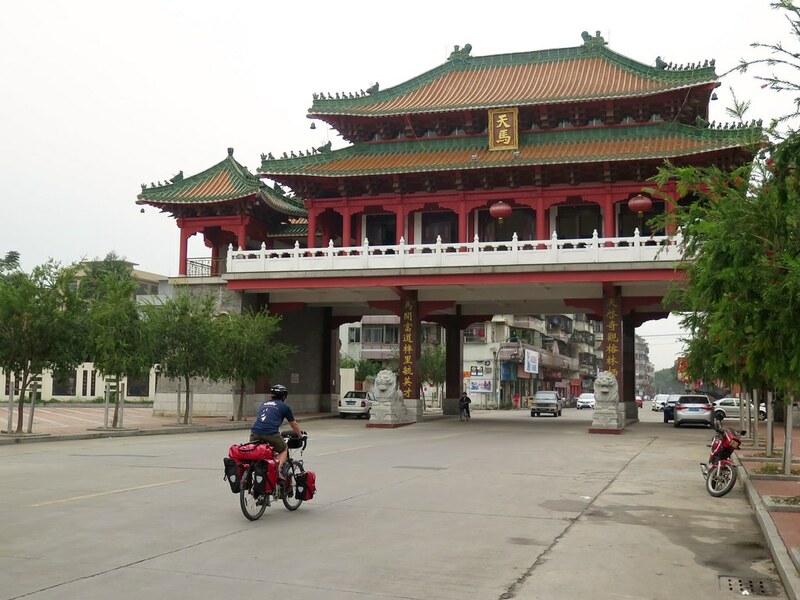 Instead we booked an apartment for 3 nights in Beihai, a medium sized city on the coast about 200km east of the Vietnam border. It looked like a decent place, and there are a couple of western pubs in town, so we thought one of them might make an effort at a Christmas dinner! 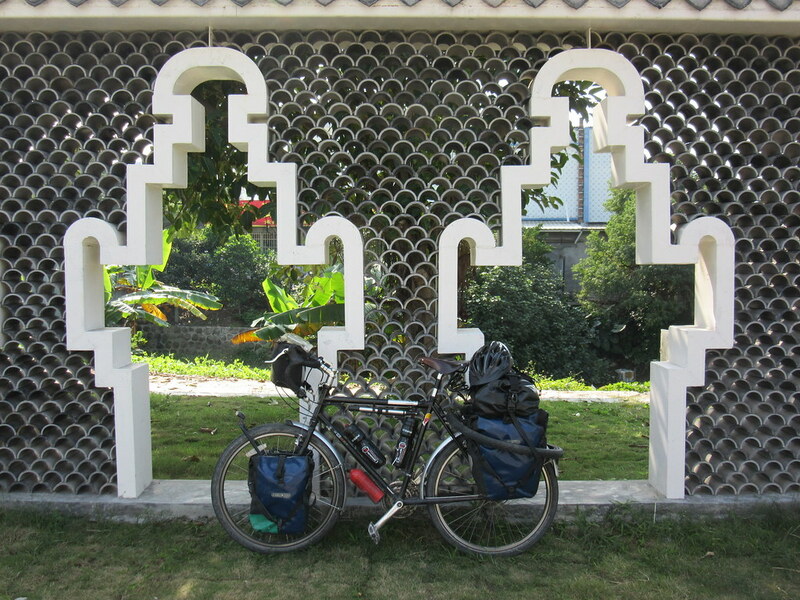 From where we were in Dianbai, we had three quite mellow days of riding ahead to get in to Beihai by the 23rd. Initially the weather continued to be fantastic. We stuck on the G325 which varied from a small two lane country ride, to a 6 lane highway, but it mostly wasn’t too busy. From the scenery and vegetation around, we definitely felt like we were getting closer to Vietnam. 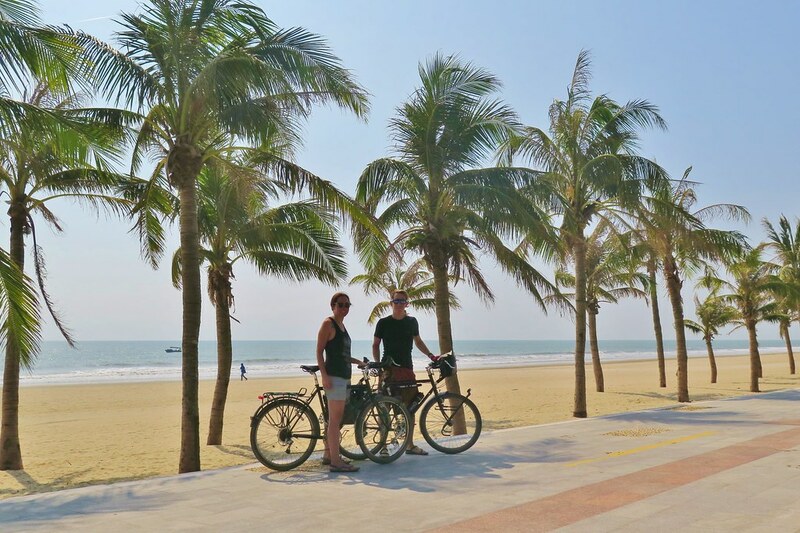 The palm trees and blue skies had us thinking ahead to the winter months casually riding through South East Asia, waiting for the weather to warm up in Western China and Central Asia. Our first stop was in Wuchuan where we stopped in a town square for a break and to enjoy the sunshine before finding a hotel. Once we find a hotel room, the temptation is to just stay inside staring at a screen which seemed like a waste on such a nice afternoon, so we wanted to stay outside for a little longer. 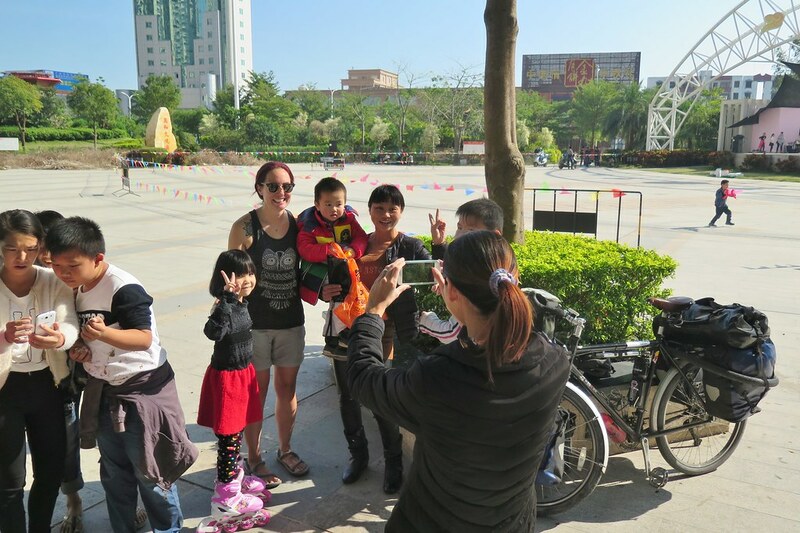 There were groups of kids and parents playing on bikes and roller skates in the square and they soon noticed the two foreigners who just arrived. We drew quite a crowd, with the kids eventually building up the courage to talk to us and ask to take pictures with us. They spoke really good English from studying at school, and they were able to ask about where we were from and what we were doing etc. Pretty much anything we do seems to attract a few curious people. From stopping to rest by the road, to buying food or going into a hotel, there are always a few passers by who stop and have a good look at what we’re up to. Sometimes it can get a bit annoying constantly being watched, but this time chatting with the kids was really fun and we left to big smiles, handshakes and waves. 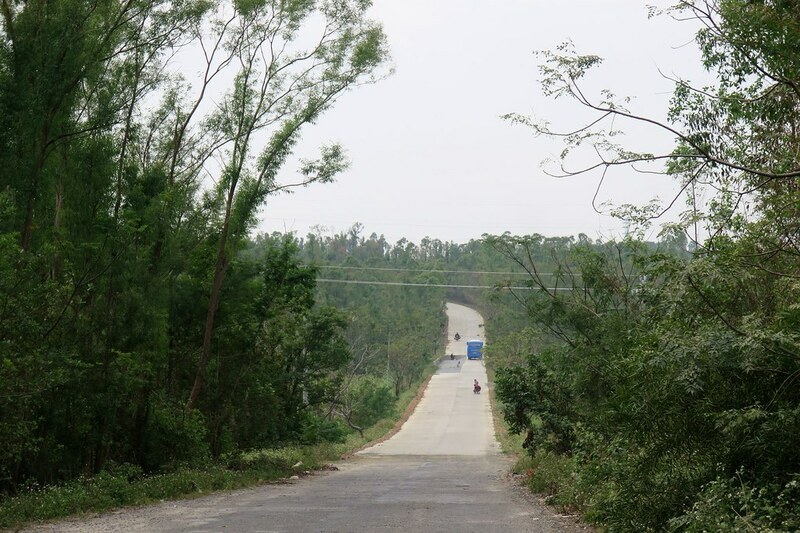 We continued through Suixi and Shankou following the same road along the coast towards Beihai. The further we got, the more construction sites we came across where the road was being dug up and repaired or resurfaced. It wasn’t a big deal, but with the warm dry weather, it meant a lot of dust everywhere. Then after leaving dusty Shankou, the weather started to change. First drizzle, but then heavy rain fell for most of the following day. 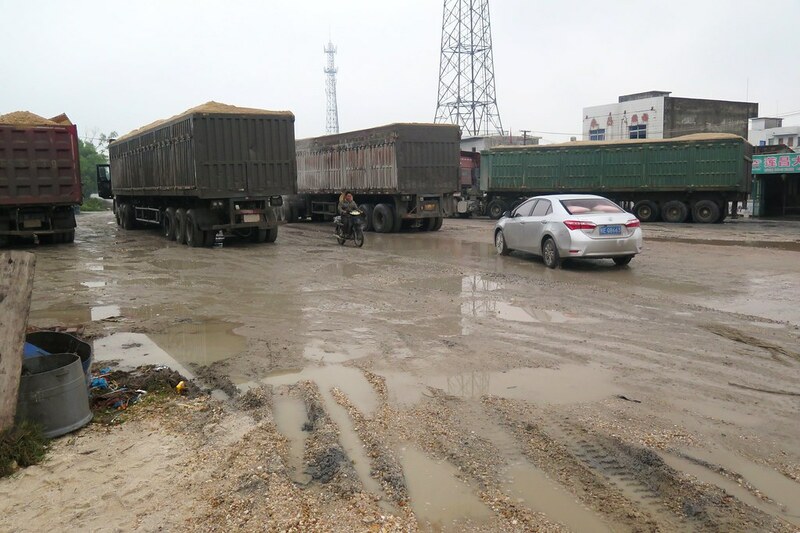 This turned the dust into mud and the sections of roadworks became a free for all, with cars and trucks taking whatever route they saw to best avoid the muddy puddles. We tried to do the same, but being lowest on the pecking order, we were often forced to ride through the deepest sections of mud at the edge of the road. 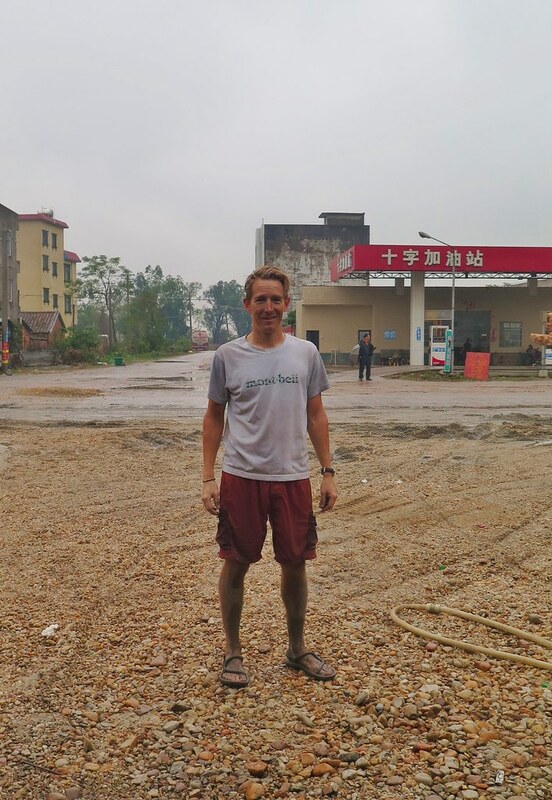 We finished the day in Hepu with our legs completely covered in mud, and our bikes needing another decent wash.
Our route from Zhuhai took us mostly along G325 along the coast, for around 700km to Hepu. 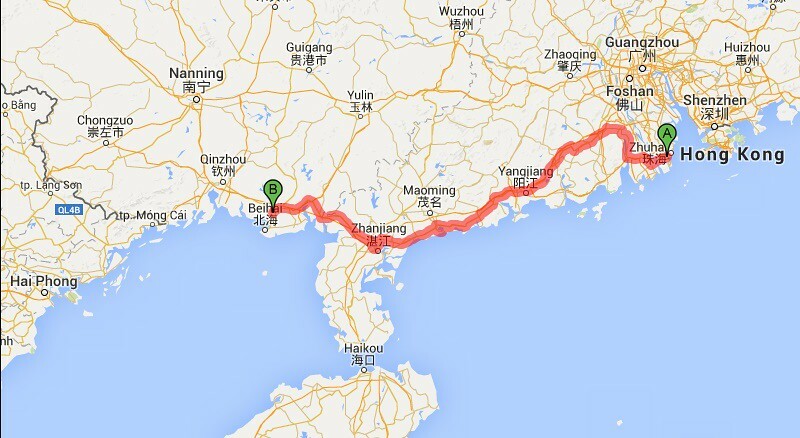 Leaving us a short ride down to Beihai. But, unfortunately, when we were spending the evening in Hepu we got some bad news from home. We decided we needed to get back to the UK as soon as possible to be with family. We didn’t have time to figure out leaving our bikes anywhere, and we didn’t plan to come back to this part of China anyway, so we needed to take everything with us. 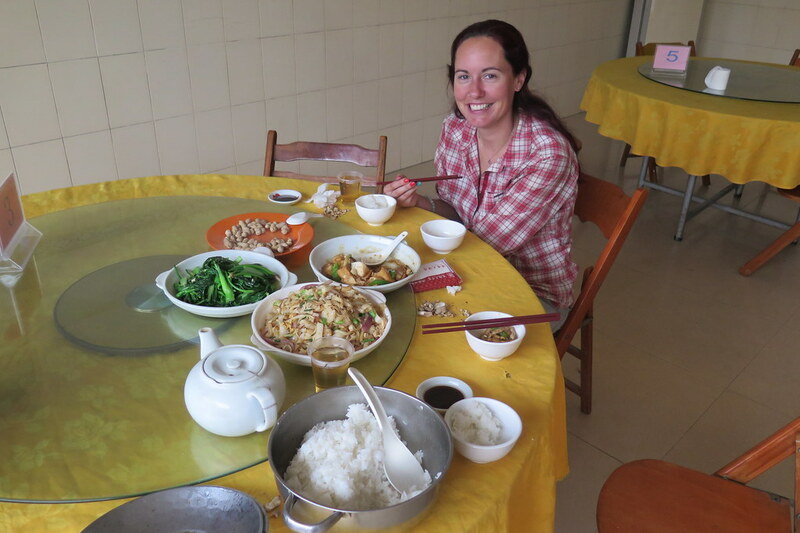 We rode to Beihai, and caught a train up to Nanning. We couldn’t take our bikes on the train, but had to send them seperately with a freight forwarding company. 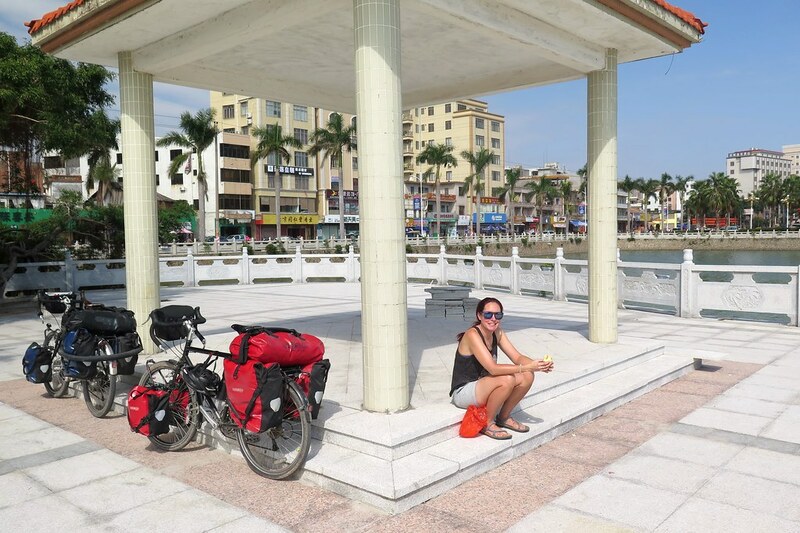 Once in Nanning, we reclaimed our bikes, boxed them up and packed all our panniers into a large canvas sack each. We flew with Korean Airlines via Seoul back to London. 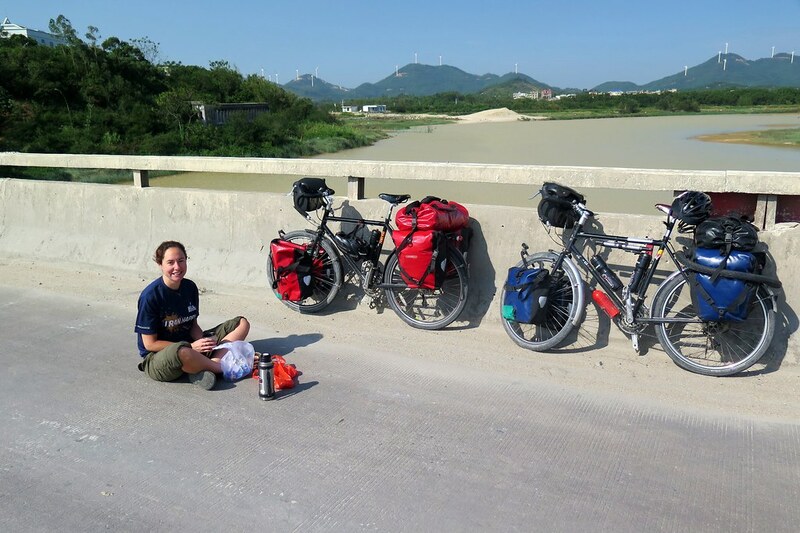 We have accrued enough miles with Korean over the past few years that we have additional baggage allowance so could take the bikes and bags. It was a long and stressful journey, getting us to Heathrow on Boxing Day. Not the way we’d hoped to be spending Christmas. We haven’t thought or planned fully what the new year will hold. We will continue our trip when the time is right, but for now we’re back in the UK with family. What was the temperature by that beach on that day? Great trip. Sorry for bad news to cut short trip. Thanks Jean. It was probably 25 C ish in the sun. Definitely warm enough for us to go for a swim! Sorry to read your sad news, do hope things improve for you both, and that 2016 will include a continuation of this amazing journey, best wishes to you both, Alyson and Murray. Thank you. Happy New Year to you both. I was sorry to hear you got some bad news and had to fly back home. I see that you are going to continue the journey soon. Now that we are back home in Vancouver I’ll look forward to your blog updates! Good luck. Thanks Maya! We’re excited to be moving again. We enjoyed reading about the Japan part of your trip. Amazing kindness! Shame you didn’t have the best weather.